Andel’s Hotel attracts the attention: the vibrant facade, the 60m tall tower on the corner of the building, not to mention the impressive lobby. The style of this lobby is modern and hip, and the designers have added something of the retro-chic to the 557 rooms and suites. The views from Andel’s are breathtaking: the panoramic views from the "Sky Bar" on the 14th floor or from the roof terrace are spectacular in themselves! These are located somewhere between the skies above Berlin and the city lights. The ten-storey hotel, which opened in 2009, is located on Landsberger Allee, on the outskirts of the trendy district of Friedrichshain. Not far away is Alexanderplatz, a major interchange station for S-Bahn. 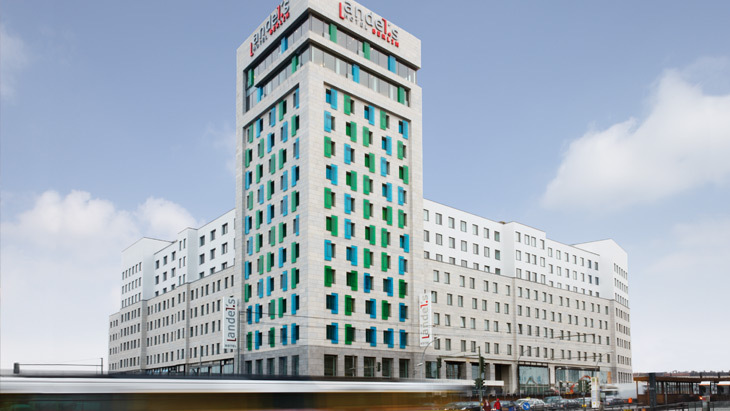 The hotel's convenient location means that visitors can easily get to all of Berlin's sights by public transport. Conference rooms and even a ballroom, a spa area and bathrooms furnished with high-quality fittings all add to the hotel's upmarket image. Highlights of the timelessly modern bathroom culture at Andel’s are the products from Hansgrohe and Axor: the design classic Axor Uno², for example, ensures that the wash basins are comfortable and easy to use. The floor-level showers in the bathrooms of the suites mean that guests can completely relax and fully enjoy that pleasurable shower experience. What's the significance of the name? Andel gets its name from a district of Prague. The hotel operator has other establishments of the same name located there, and also in Poland. On the Andel’s Hotel website there is a 360-degree camera offering a panoramic view of the lobby and various other rooms.